How it worksIt could not be any simpler. As soon you complete the Titan Bet registration process, your account will be then automatically credited with a €/$ 5 Free Bet valid for placing bets on any sport and market covered at Titan Bet. To get the remaining €/$ 15, visit Titan Poker and download its free software. Once done, you will only need to log into Titan Poker with your Titan Bet username and password and create a valid poker nickname. Then, just contact the Titan Poker support team via chat and they will kindly credit your account. Your Titan Poker bonuses will show up automatically. That easy! $5 free for Titanbet on any sport at any odds, will be given automatically upon signup! $5 Free to enjoy the thrill of their Slots Machines and have a shot at taking home one of the huge progressive jackpots. Open a new account with Titan !!! 1. 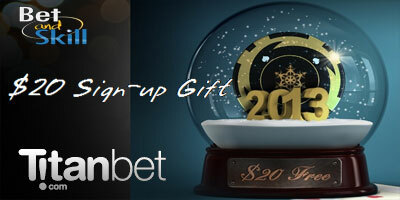 This offer is valid for all eligible players that sign up to Titan Bet starting December 20th, 2012. 2. Only players from the following countries are eligible for this promotion: Andorra, Australia, Austria, Canada, Chile, Denmark, Finland, Germany, Iceland, Ireland, Luxembourg, Netherlands, New Zealand, South Africa, Sweden, Switzerland, Uruguay. 3. Players will need to complete registration and have a valid nickname to be eligible for bonuses both in Titan Bet and Titan Poker. 4. Players need to provide the relevant promotional code upon completion of sign up in order to receive $5 Free. 5. All General Free Bet Terms and Conditions apply. 6. Tournament tokens are valid for 30 days after issue. 7. Tournament Tokens for the $20 Free offer can only be used in the Titan or Mini Titan SNG's. 8. Casino bonuses will be displayed when players play any of the Titan Bet and Titan Poker casino games available in the sportsbook and poker software respectively. The bonus amount will not be displayed in player's accounts outside of the casino games. 9. Winnings from the play bonus will be transferred to a player's real balance only after the player has wagered the value of their bonus 30 times. 10. Bonus amounts and winnings are allowed to be withdrawn only once wagering requirements are met. If a withdrawal request is made prior to meeting the wagering requirements, the bonus and winnings will be removed. 11. Casino bonuses are valid for 30 days. If wagering requirements have not been met within 30 days, both bonus and pending winnings will expire. 12. While wagering on casino games, a player's real balance is used before any bonus cash. 13. The Casino bonus can be used on all Titan Bet and Titan Poker Casino Games excluding table games such as Blackjack and Roulette. 14. Cash Bonuses are issued within 24 hours pending eligibility. 15. Players are required to generate 50 Titan Poker Points for every Cash Bonus Dollar received in order to make a withdrawal. 16. Stake limitations: Players receiving the free cash bonus will only be allowed to play in the following poker games. All restrictions will be removed once a player makes a deposit. Players need to contact support once depositing to remove the restrictions. 17. Once bonuses have been issued to a player's account, the player will have up to 30 days to login to their account in order to lock in their bonus. Failing to do so will result in expiration of the bonus. 18. Bonuses are not transferable. "Titan offer a new $20 no deposit bonus package (Betting, Poker & Slots)"